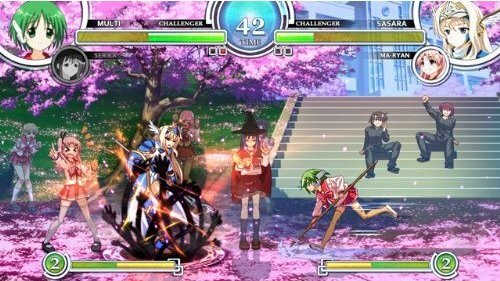 ABOUT: Aqua Plus and Examu teamed up to create AquaPazza, a 2D crossover fighting game featuring high-res sprites and fast-paced, assist-based gameplay. 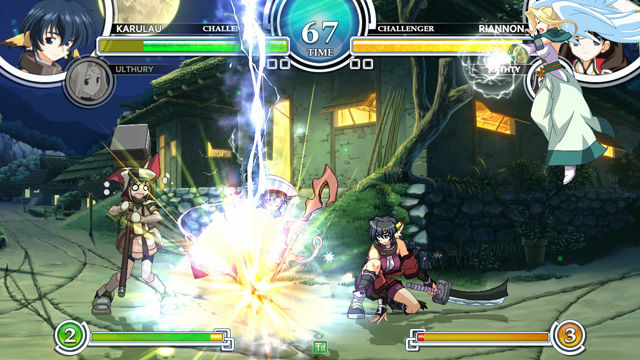 The game features characters from Tears to Tiara, To Heart and Utawareru Mono and Utawareru Mono. 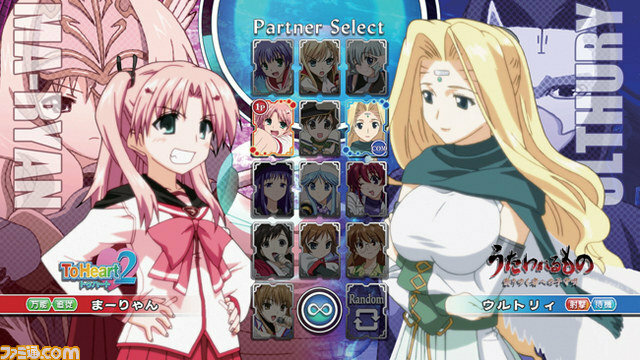 The ladies of Aqua Plus's dating sims usually compete for your affection, but in AquaPazza, they exchange punches, kicks, and huge super attacks to see who is the best fighter. 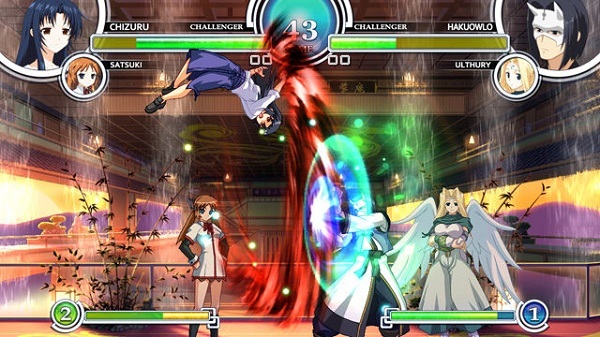 Aquapazza was released in Japanese arcades in June 2011, with a PS3 version arriving in 2012. Atlus brought the game to North America November 2013 as a PSN & PS3 disc-based title, priced at $29.99. 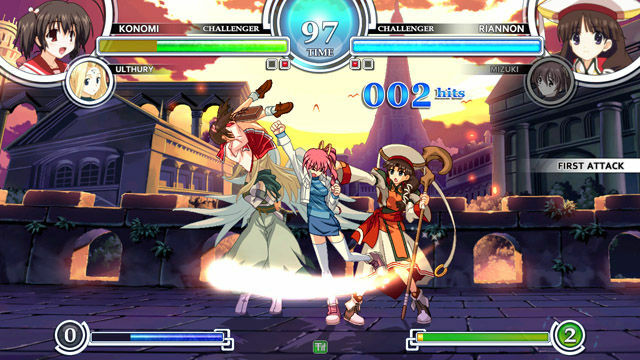 The console version contains everything from the Arcade version in addition to some new features, including: additional characters, Story Mode, Score Attack, Training, Network Mode, and Gallery. REVIEW: First off... I'm not at all familiar with any of the characters or series appearing in Aquapazza. 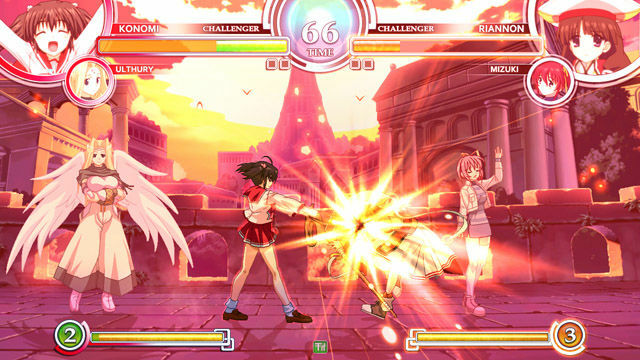 And to be perfectly honest, I'm also not typically a fan of uber-anime fighting games (especially not those of the "girly" type). 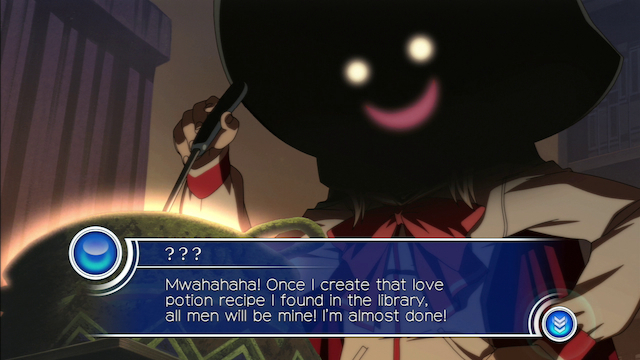 Sorry, but the world of anime dating sims and "love potions" is territory I've never had the urge to visit (and never will). However, as a fighting game connoisseur, I try to be open-minded and step out of my comfort zone when possible. 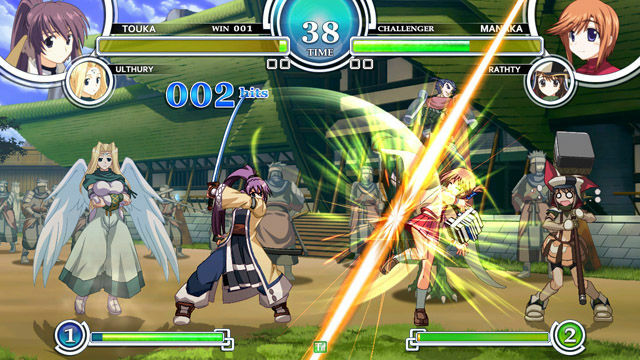 While the narrative of Aquapazza is out of my comfort zone, the intuitive, traditional fighting mechanics certainly are not. This game has been a favorite in the Japanese tournament scene, and after going a few rounds in Aquapazza Plus Aqua Dream Land (whatever)... I can understand why. I can respect a game that isn't "super air-dash happy"... and was pleasantly surprised to see the total absence of air-dashing in Aquapazza! 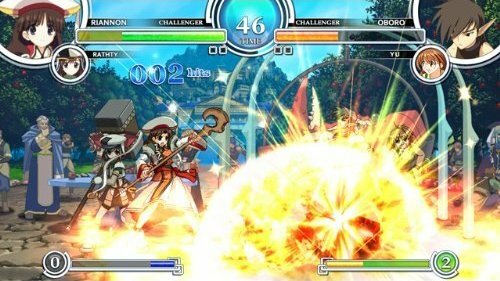 In some very fundamental ways, Aquapazza almost has a Street Fighter III "pace" about it (yes, that's a good thing in my book). 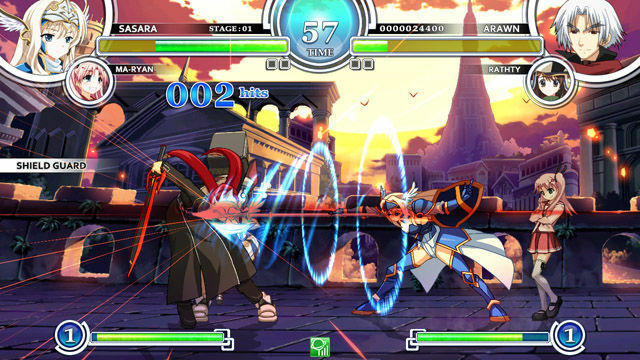 Aquapazza features a mix of conventional and unique mechanics, but nothing overly complicated. However, it'll take a bit of research (online) to get a grasp on all the ins and outs... as they're not explained particularly well in the game itself. 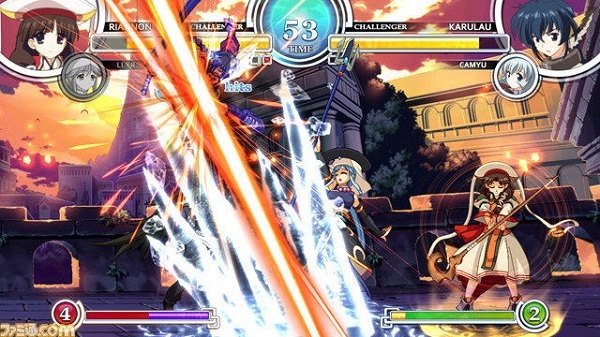 One of Aquapazza's defining mechanics is the "Active Emotion System". 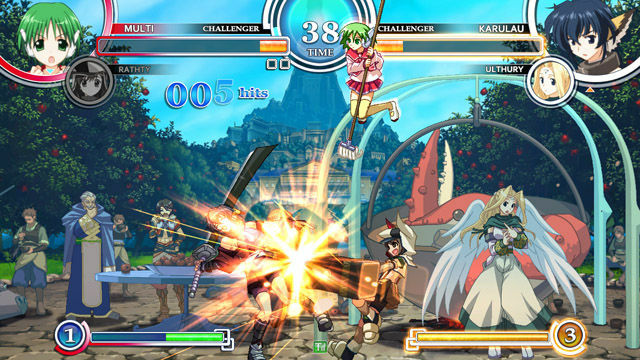 The AES basically rewards players who play aggressively and punishes players who block too much. When characters have "high emotion," players will receive a 10-15% damage boost. When characters have low emotion (from turtling), this will lower their defense by 30% and increases the possibility of guard breaks. The characters themselves also have some very interesting (and sometimes hilarious) mechanics. 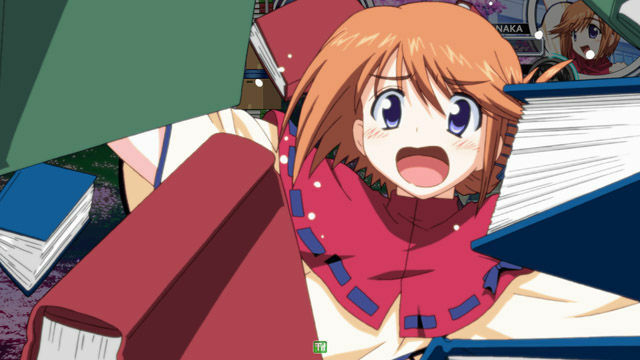 For one example: Manaka is a schoolgirl carrying a pile of books. Her entire moveset consists of her tripping and falling over herself, throwing books, and knocking down magical bookshelves. I've never been into this sort of thing per se, but I have to admit I was entertained. Another example is Morgan (who turned out to be my favorite character in the game to use), a female archer who can shoot 20 arrows per round. 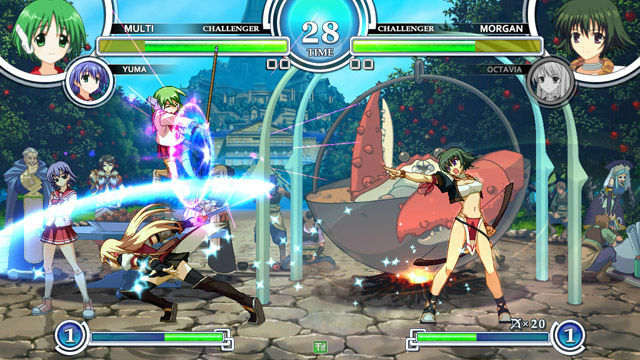 She has an impressive array of different arrow-shooting techniques, and some of her specials even give her arrows special effects, such as poison or locking characters out of their special moves. I could type a paragraph about each character's unique abilities... but I think it's best to experiment with the characters for yourself. You might be surprised with what you find, even if the characters' appearances don't sell you at first. And thanks to the fairly standardized movesets (filled with "QCF / HCF type" moves), experimenting is a walk in the park... (literally, and it's filled with delightful, pink cherry blossoms and anime girls in skirts). 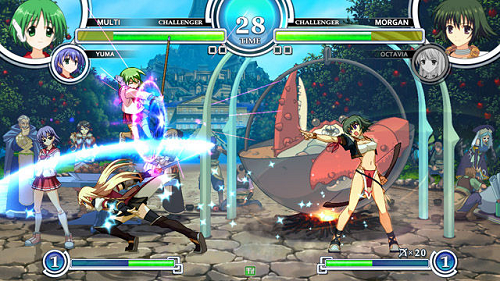 In Aquapazza, there are 11 playable characters and 13 different assist characters to choose from. 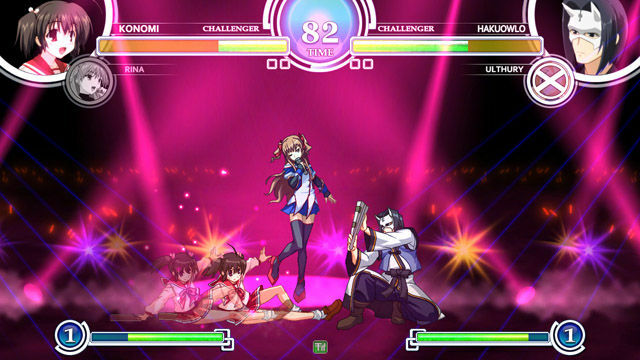 And I actually found Aquapazza's assist system to be the most interesting part of the game. 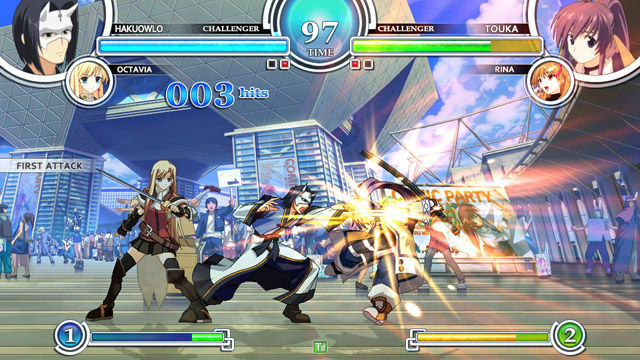 Most assist characters follow your main character around in the background. 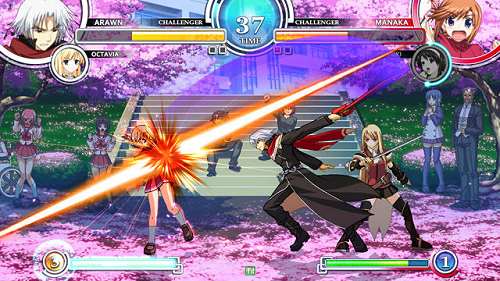 Not only does it look neat, but the effectiveness of your assist character's attacks often depends on their positioning in the background itself. 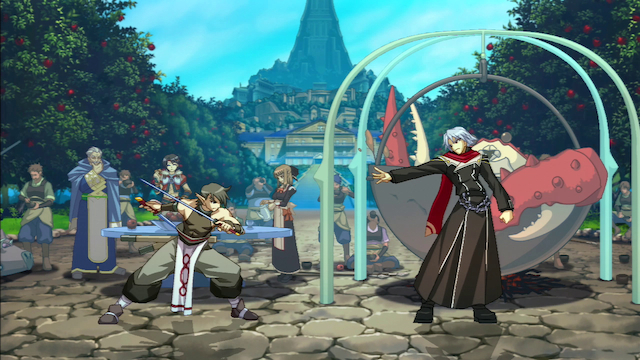 (It's not like MVC, where your assist always initiates where your main character is standing.) Furthermore, some partner characters "walk slow" and others "walk fast" in the background, which seems to balance them out (considering the strengths of their various abilities). 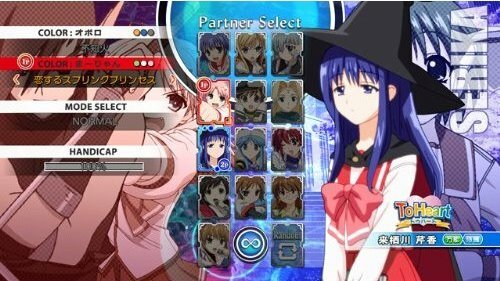 Each partner character can perform 2 different types of attacks, so there's obviously lots of room for developing strategies. 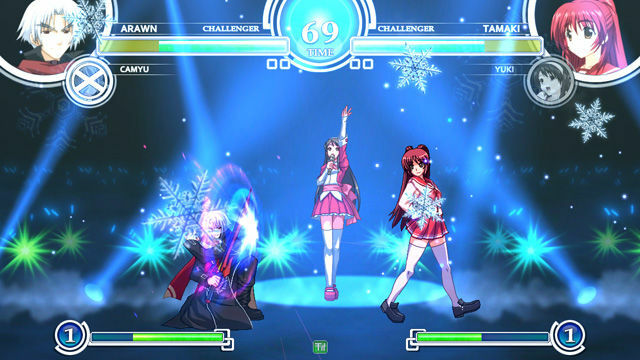 The other type of assist characters (typically J-Pop stars who break out in song) magically appear in the background and offer your main character a power-up of sorts. 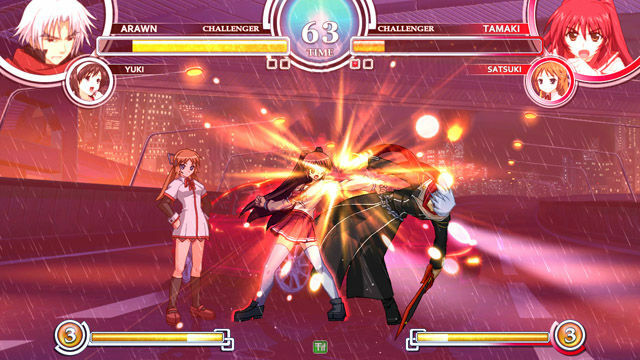 The J-Pop chick I most enjoyed using gave my main character an extra hit for every attack (almost similar to V-ism in SFA3). The assist system seems solid enough in terms of gameplay, but it's also pretty cool aesthetically. 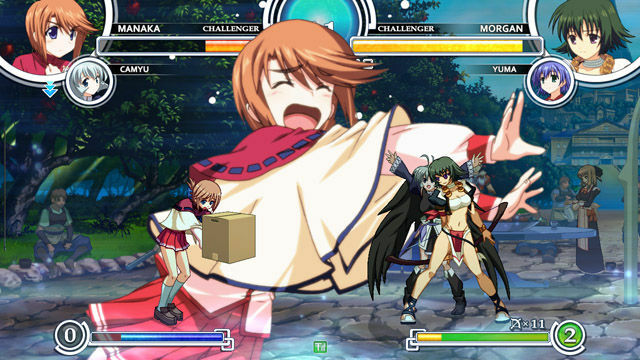 I wish more fighting games would implement this effect, actually. The background partner characters have just as much detail as the main characters... so they mesh together perfectly on-screen. 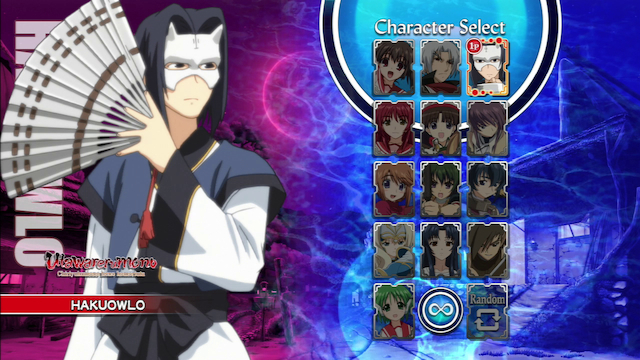 Also worth mentioning is the wide variety of character color options (even for assist characters), so fashion-oriented folk can effectively "match" their characters if they desire. There are also a ton of color options for the main playable characters, and even some entertaining "names" of specific color schemes. Fun stuff. 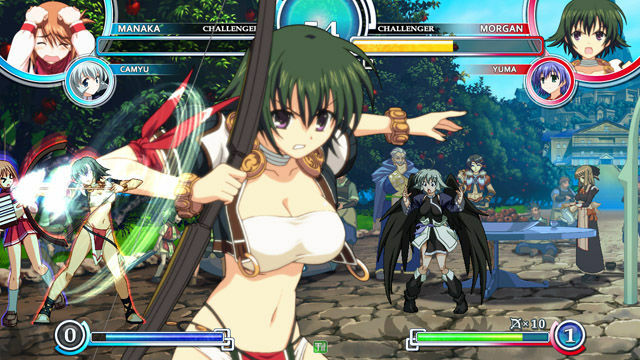 Aquapazza is a great looking 2D game, although the art style might not float everyone's boat. Expectedly from this sort of manga art style, there are some weird character proportions and general quirkiness, but the good news is... all character sprites are clean, colorful and pretty sharp. 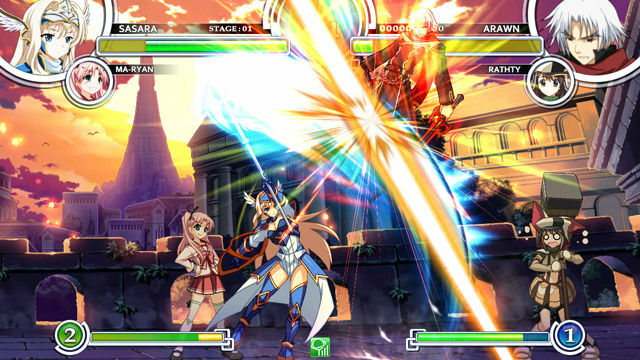 Some animations aren't the smoothest or most natural, but most effectively supply that "anime style" look to the game. 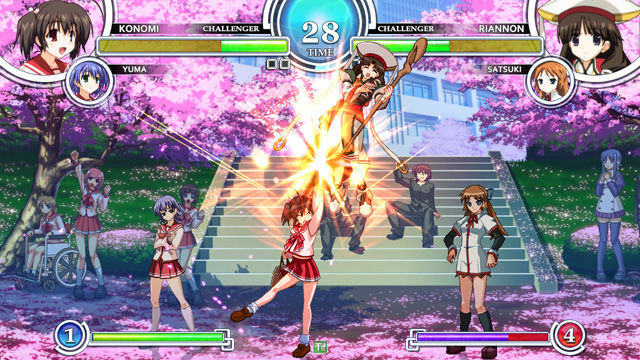 Projectile effects also pack a punch and contribute to Aquapazza's 2D glory. The "cut-in" artwork during super moves is actually some of the best I've seen in an anime fighting game to date and looks incredibly natural (to the point of not even noticing it anymore). The epic Level 3 "Splash Arts" also make a statement on-screen when they connect. 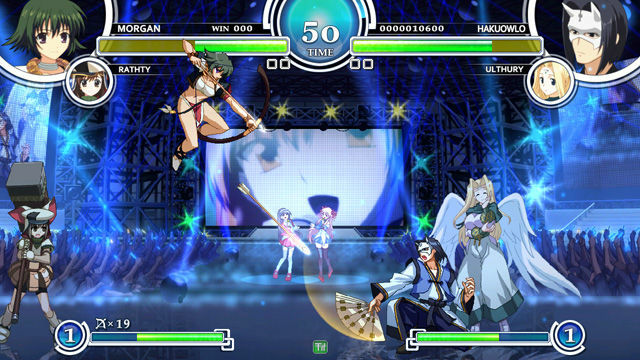 There are 13 stages in Aquapazza, all of which look just as clean as the character sprites. One thing Aquapazza does right is how amazingly well all of the visuals seem to fit together. There's a lot of stuff going on in the backgrounds, but they're also not too busy or distracting. From a samurai village, to a J-Pop concert stage, to an anime convention center... all of the backgrounds offer a lot of personality and diversity. 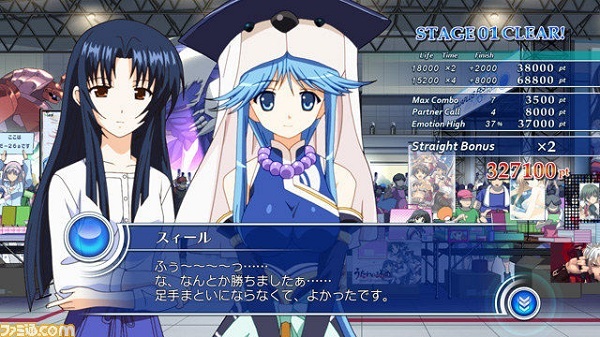 Plus, there are a ton of character cameos for fans who can actually recognize them. 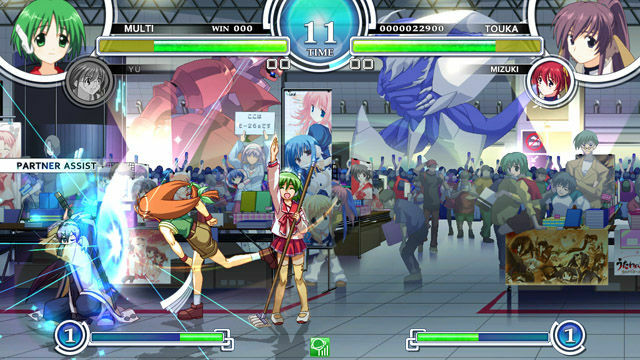 I'd say Aquapazza's backgrounds are one of the best aspects of the game, visually. Yeah, they're all pretty cool. Even though I don't know what the hell is going on with the story (nor can I bring myself to even remotely care), I can tell that there's a lot of fan service going on in this game. 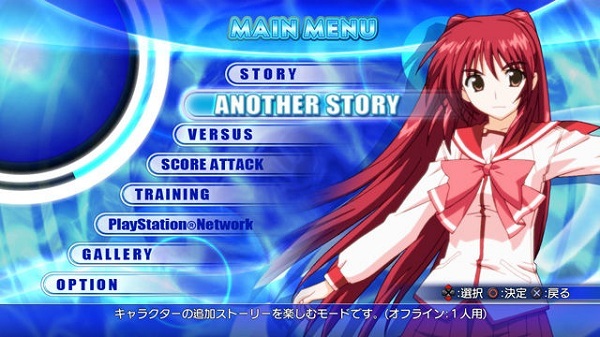 There are actually two separate Story Modes in the game. Within Story, there's quite a lot of character-specific (spoken) dialogue between rounds and before boss battles. Surely fans of the series will appreciate these small interactions and details. For the record, all voices in the game are Japanese and have English subtitles. 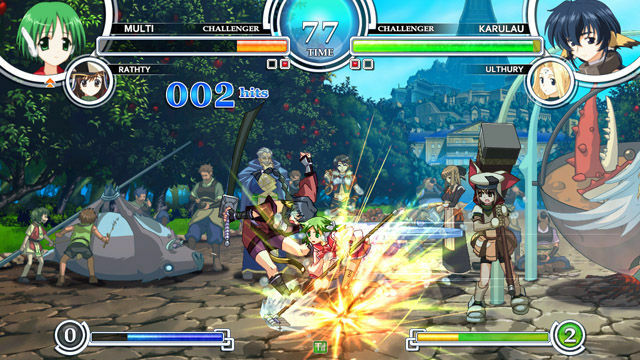 To wrap things up, Training Mode is halfway decent but doesn't quite cover all of the gameplay nuances. As far as online goes, you can edit your player profile a bit with your favorite characters / colors / titles, etc... but unfortunately, the netcode seems pretty bad. All the online matches I played were plagued with terrible lag (unplayable). The online lobbies were also quite barren when I ventured online. 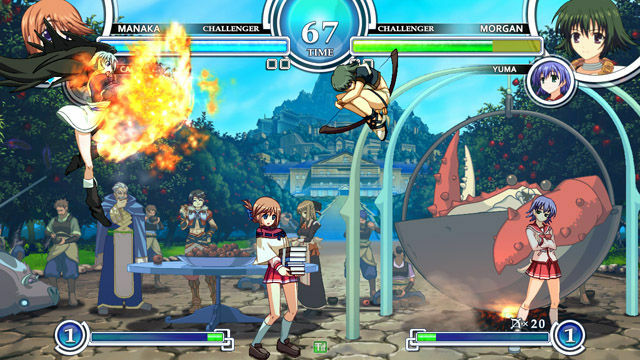 Final Words: As a niche game, Aquapazza probably won't appeal to the majority of fighting game players. Like I said in the beginning of my review, it's not my kind of game... not by a long shot. 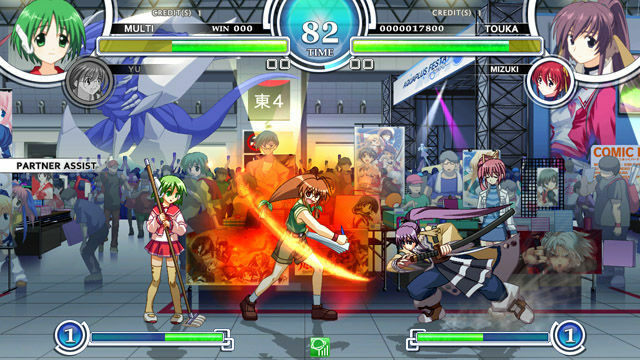 However, Aquapazza struck me as a "clean" 2D fighter all around, and surprised me with its solid effort. 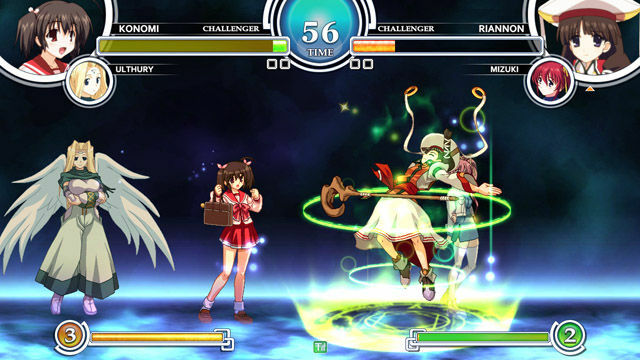 For an obscure, "offbeat" fighting game, it has charm in places you might not expect. 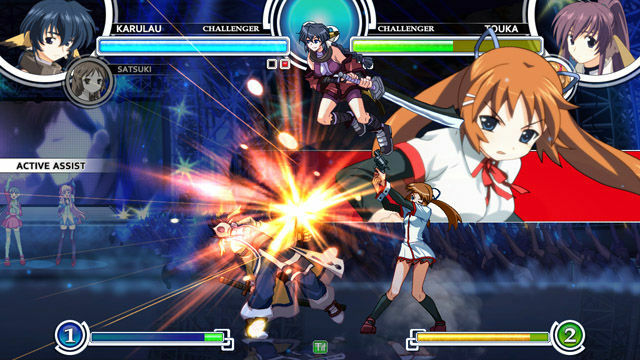 Make no mistake, Aquapazza is a "girly" fighting game. In a way it seems like it was made just for girls (but we all know that's not really the case). (Do some dudes really play games like this?) lol. Whatever floats your boat I guess. 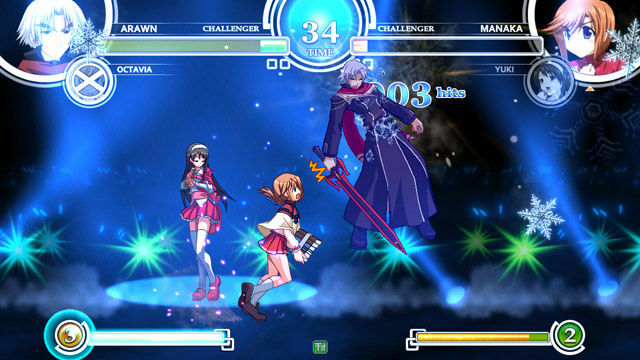 Unlike Arcana Heart... there are actually a few male playable characters! *gasp* However, these "guys" aren't exactly "manly"... not by any stretch of the imagination. Actually, I think it's possible that a couple of them may even secretly have female genitalia... (well this is getting awkward. Too edgy for ya?). Moving along. 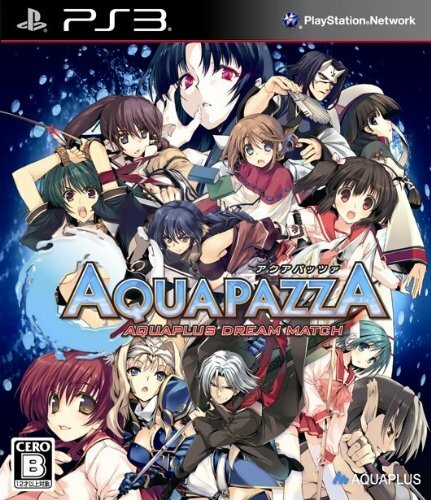 All jokes aside, Aquapazza is decent. 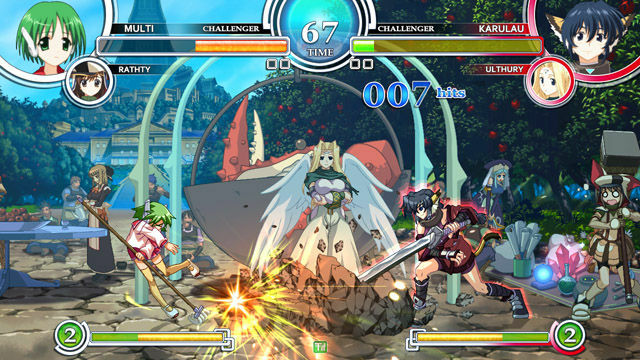 The core gameplay is fairly basic, smooth & intuitive, and the vivid diversity between all the characters' play styles warrants a few solid sessions with the game. While most movesets are fairly straight forward, I found a few super move commands to be unnecessarily difficult. 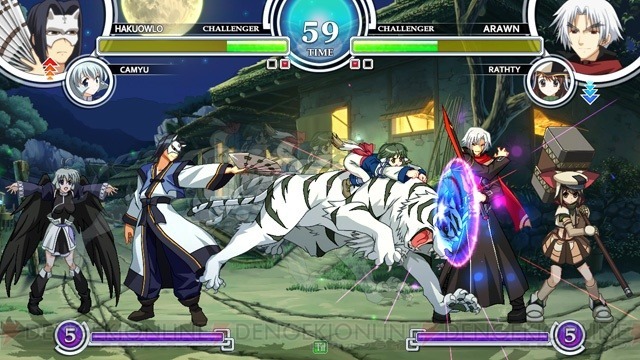 On that note, if you're thinking of playing this game seriously, you're going to need a solid arcade stick in order to hit some of the more precise button inputs (required for some super moves). The goofy storyline and stereotypical "anime" mannerisms of the characters didn't make me laugh (as they were intended? 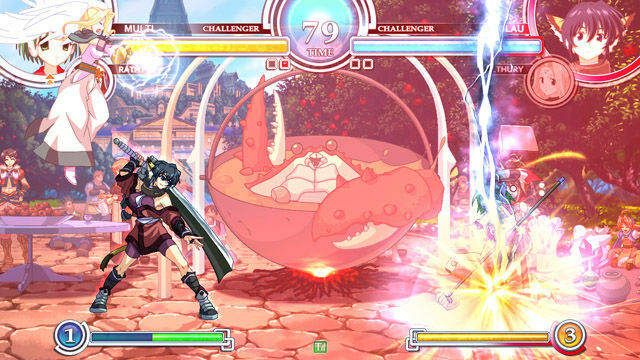 ), but a lot of the moves, animations and combos did make me smile and even chuckle a few times. That said, there is some very basic entertainment value sprinkled throughout the game. If you're an "anime person" or simple appreciate 2D artwork in motion... you should definitely check out Aquapazza. I'll admit, Aquapazza is better than I expected. However, the very essence of the game, the 'title' itself, and all the bright girly colors, were all slightly painful to me in some weird way... but I wasn't left with any permanent scars, at least. (Okay, so it wasn't that bad.